GC's Thanksgiving Day Style Guide | Grand Central Magazine | Your Campus. Your Story. We can shamefully confess that our ideal Thanksgiving outfit consists of overly baggy sweatpants, a sweatshirt and fuzzy socks. After all, Thanksgiving is the one day of the year when two servings of pie (and stuffing, who are we kidding), is completely acceptable. Since sweatpants aren’t widely accepted at the Thanksgiving dinner table and pride is hard to sacrifice, we’ve styled two alternative outfit choices that will keep your fashionista status in check. You can never go wrong with an oversized sweater and leggings, especially on Thanksgiving. This effortless look is as simple as it is sophisticated. We recommend polishing this classic combination with a turtleneck sweater, dark wash jeggings (just as comfortable as leggings, we promise!) and riding boots. This look is suitable for Thanksgiving with a significant other, or a relaxed dinner with your family. 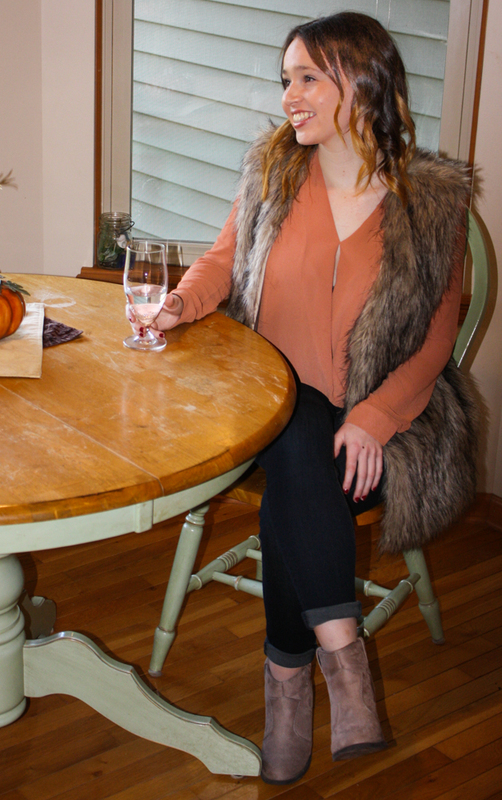 If you’re feeling extra festive this season, pair the jeggings with a burnt orange top, faux fur vest and taupe ankle booties. The surplice top we chose for this look is equally comfortable and chic. We recommend wearing this look for a casual Thanksgiving dinner with your family. We hope you enjoy your Thanksgiving. Stay stylish, and above all, thankful. Separator image Posted in Student Styles, Style, Style & Beauty, Women's Style and tagged with campus fashion, Fall, holiday, Morgan Wood, Style, Style and Beauty, Style guide, Thanksgiving, Trends, Women's Style.